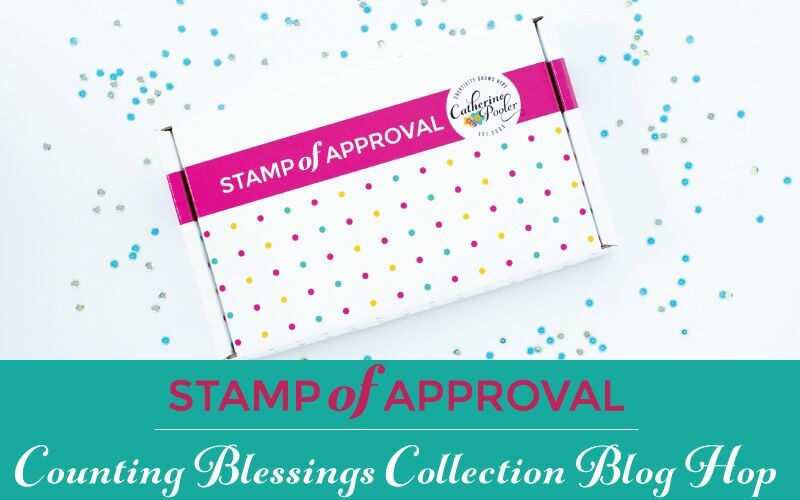 Welcome to Day 2 of the Stamp of Approval Counting Blessings Blog Hop. You should have come from Kristie's blog (full blog list below). 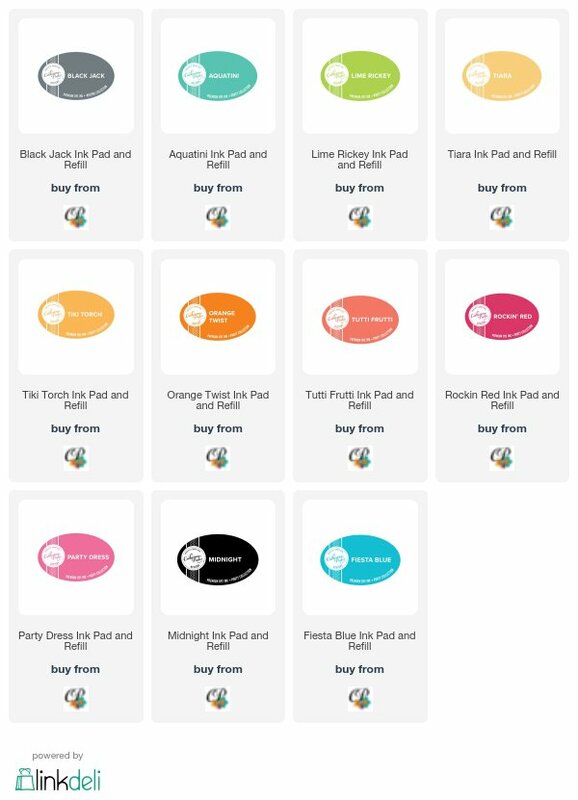 Oh, wow, this collection is absolutely stuffed FULL of amazing products - it includes basics that you will use all the time as well as some amazing season-specific goodies. I couldn't stop making cards with these incredible stamps, dies and stencils! If you’re new to Stamp of Approval – click here to check out everything you need to know about this amazing collection of Stamps, Dies and other goodies. You can WIN your Stamp of Approval Collection! THREE commenters will be chosen at random from all the comments on all the blogs (one each day). The more blogs you comment on, the better your chance of winning! Entries close on THURSDAY, August 17 at 9AM EST and will be announced on Catherine's blog later that day. Let's move on to some cards so you can see some of the stamps, dies and stencils included in this fabulous collection! For this card, I used one die repeatedly (a 3x4 grid of tiny hearts) and popped it up over a blended rainbow. I used the same scalloped rectangle die as the first card, but only on one edge. Clean, simple but lots of impact! For this card, I stamped the bunch of daisies 5 times to create a larger flower. I cut a circle and sponged pink and yellow ink for my flower centre. I love the simiplicity of the black and white + rainbows. So clean! Love how quick this card was to make with such a great background! Backgrounds are my thing! THis kit is growing on me. Glad there is a blog hop to give me inspirations and show me what the kit is about. If its a 'ready to go' kit, I would think there are inks, but I am not seeing any.. are there inks? Oh my favorite Ardyth..😍 everytime I see your work.. I go..wow! These cards are awesome. I am gonna try the ghosting technique.. I never leave your blog without the urge to make something! Great ideas. Awesome cards. Love them all! Such amazing cards! Love that rainbow. Very creative cards! I love the colors, stamps, stencil and die! Thank you for the quick video showing how you used the leaf stencil. Wow! The ispiration just keeps coming. Love your cards. Great cards!!! Love your ideas!!! Thank you for sharing!!! LOvely cards! I really love the tiny hearts die on the 2nd card. Outstanding cards! Looking forward to seeing more. Love all the creative ideas that go into each card. They are all great. Thanks for sharing. OH my gosh beautiful!! I love your stenciled leaves and the gorgeous colors! Such inspiring cards. Way to rock the colors and diecutting...awesome projects! I enjoyed seeing your cards. They are very pretty. I've never seen the ghosting technique before. I'm going to do that on my card making now. Thanks for sharing your talent. Great cards. Before scrolling down I thought you used the get trio to make a movie card since it looked like the top of a directors board thing. Love the combination of techniques that are used in your cards! Awesome!! Thanks for showing us some new ideas and techniques! Really cute cards! Loved the quick video. The rainbow elements of these cards are so pretty:). I can't wait for this kit. Wow - what great cards!! Great cards!! I love the rainbow hearts - so CAS and so pretty!! Big fan of the �� with hearts and the background for the ghosting leaf motif! Those larger sentiments are a big hit for me!! Wow! Your cards are fantastic. I love the "ghosting" technique on the first card. Beautiful cards. Love the stenciled leaves. Especially love the Thankful font. Thank you so much for your ideas and inspiration Kristie! Wonderfull ideas thanks for sharing! I just love your cards! Each is unique and shows off the SOA collection in great style. My favorite is the first one with the leaves. Beautiful! Wow! Such creative takes on these stamps! I'm inspired to think outside the box. Love the first card and how the punching out of the hearts added the finishing touch to such a great card. Using the tiny stamp to create the flower is brilliant! Thanks for sharing your creativity! Fun ideas and great cards! Thanks so much for sharing on this fun blog hop!! I had the same idea with the little hearts but you've stepped it up a notch with the background underneath! Thank you so much for the video - I love learning new techniques!!! Thank you for sharing your ideas! I really love these. So different, and creative. I like that first one with the ghosting technique and that is on my list to try! The cut out baby hearts is super cute, too. The collection really is versatile. Thanks for sharing! Love your cards! Those bright leaves are amazing! Love your cards, so creative. Great ideas for cards. The stamps are so awesome can't wait to get them!! All three cards are great! Can't wait to see what is up next! Loving the heart cut outs. I'm so enjoying seeing all the ideas! Oh wow great cards!! Love the rainbowcollors! Great cards! Love the colors you used on all of them and the rainbow hearts are adorable! Wow!! Super gorgeous cards!! Love your creativity!! This is such an awesome collection! I love it! Great cards!!! Oh wow! All your cards are so beautiful! I love in particular way the bright colors of the first one!!! Amazing!!! All of these are amazing, but that you matter with the rainbow hearts is so clean and simple,and just perfect. Cute cards! I liked the video too. such a nice variety of cards. Each card is such a unique look - I can't pick a favourite! Great use of color, I am hoping I will be able to get this set! Terrific ideas! So I inspiring....thanks for sharing!! So pretty! Love those little hearts too! Gorgeous cards! Great use of the elements of the collection. I really love every single card you created! Great job. Such clean simple looking cards with such a great look. Love the clean and simple designs! Love the technique used too! This Soa collebtion is amazing! I LOVE hearts and the layering you did. Such amazing cards. I'm in love with the "You Matter" card... simple words with such an impact. The repeated heart design is so significant (for me). I saw your card and it reminds me that if we all have compassion everyone matters. Thank you!!! Ardyth love seeing your style shine through these products. Fab collection of cards. Such nice examples you show us, that we would able make in a few days with this new SOA box! Gorgeous cards...love how you used the stencil on the first card. Love these cards. This is so much fun getting all of these great ideas. WOW these cards are stunning, love the almost hidden leaf effect on the first one. Black, White, and Rainbow! All you ever need. Beautiful rainbow cards, love your backgrounds! such clever cards, they all turned out great! I love the rainbow cards, especially the mini hearts! So fun! Great use of colors! I really like the blending on the first card. Stunning cards! Love how you've used the stencils! LOts of inspiration! My stencils never look that good! Absolutely fantastic cards!! Sooo fun and creative!! All of your cards are fantastic! I especially like the hearts die cut out. I love how you used the leaves stencil...great cards...thanks for sharing! Ardyth, I loved all of your cards! I really like the first one with the stenciling you did! Thanks for sharing your talents! I absolutely love the colors on the cards. The brighter the better. Can't wait to try some cards. What fun cards! Love them all. These are my favorite cards so far! Love, love, love!! I love your "you matter" card! It's simple but lovely and would surely lift anyone's spirits! Wonderful, indeed! Great cards! I love the bright, fun colours too. Gorgeous background...thanks for the technique video! Awesome cards! I love the rainbow combinations. The hearts die cut makes a great CAS card but is so striking! Beautiful! Great cards. This kit just keeps getting better and better. The mini hearts are AMAZING and the technique for the leaves, just wow! Absolutely lovely cards! Ardyth! Great use of the SOA Collection goodies. I think you've used more items for your cards than I've seen so far! AWESOME cards! Glad to see you were chosen for the Design Team as you have some fresh ideas! Love all your cards - can't wait to CASE when I get my collection! I love your perfect blending! What a great way to use those dies and stencils! Thanks for sharing! Thanks for sharing these wonderful techniques. I love those little hearts. Awesome cards! I can't wait to order. Then another wait. I love how you used the chevron stencil and added the black and white diagonal stripes to the stitched die( which is a favorite of this collection). The tiny hearts are so cute. The way you made them the focal point was very clever. I always enjoy seeing ideas using the smaller stamps, like the little flowers, simply gorgeous. OMG! I love your cards. The colors are beautiful. I love the color combo and the hearts. Amazing card designs! Love the first card with the ghosting technique! I love the ghosting technique. Such amazing ideas!! Love the cards. Thanks for your hard work. Such amazing talent! Your cards are so gorgeous! 3 Beautiful cards Ardyth. Thank you for the video as I wondered how you did the leaf pattern. Gorgeous! Fantastic cards! All of them are so pretty! That little heart idea is so darn cute! All three of your cards are so unique from anything I've seen yet on this hop. They are amazing. Love to see how incredibly versatile this collection is. Loved your cards! That scallop die looks so fun to work with! Thank you for the video! Such fun cards. I love how you used the stencil and stamps ununexpected ways. Awesome job! I love your cards. They are really unique. You really thought outside the box and showed the versatility of this collection. Thanks. Love the cutouts over the rainbow backgrounds. Your cards are so cute! I love the colors. So many fabulous ideas. Thank you for sharing. I love, love, love the "you matter" card, so sweet. Amazing job on all your cards! You did an awesome job with the colors. The "You matter" is just what I need for a special young lady at church. Ardeth, love your cards! The first one really makes me think of autumn and the multi colors of leaves that time of year. Definitely, my favorite card of the three. Can't wait to get this SOA box! I LOVE your cards, great ideas! I love the heart cut outs. Loving all the colours on these cards Ardyth! Gorgeous! Thanks for sharing! Darling idea with the daisy stamp. Its amazing how creative and versatile people are, even using be the same fabulous products! I love all the punched hearts! I absolutely love your cards!!! The colors are fabulous and this collection is amazing! All three of your cards were beautiful but the ghosting with just a hint of the leaves is gorgeous!! wonderful cards you made here that just feel happiness in each..Thank you for sharing them here.What a fun blog.. The You matter... rainbow card is my favorite so far from this hop! Just love it! Cute, cute, cute, cute, cute!! Thank you for sharing these with us! Love the colors! You are so creative! Wonderful cards! I love the cut-out hearts on the first one. OH that second card made me gasp in delight at the CAS and rainbow! Love the cards . I love the coloring and then putting a stencil on top of them for a unique look. OH MY!!!! Your cards are way too curwband creative!!!!! Gorgeous cards, Ardyth. I haven't tried blending and colour lifting with my CP inks, but after seeing your card and video, I will definitely give it a go soon. Beautiful cards! So much talent. Such great cards from everyone with this SOA! I think this is my favorite collection so far! Such a simple but impressive technique on this card! I'm intrigued by your square cards! Fun to change up the standard rectangle. My fave is the second card. Clean, simple and jaw-dropping--love your use of the mini hearts die. Great cards!! I love the colors and the technique on your first card!! Love those leaves; the colors are beautiful and the black contrast is perfect. The you matter card is so gorgeous!!!!! Love love it. So very cool technique pieces. Thanks for the video. I love the idea of simply using water to "ghost" an image. I'll need to experiment. All your cards are stunning!!. Appreciate the video tutorials. It helps me to see how you actually create your cards. Thanks for taking the time. Beautiful! I love the bright colors on these cards. Loved the video and how quickly you put such a stunning card together. First, thank you for the video! Great technique, fabulous card!!! I love all three of your cards! They're so different from each other and different from any others in the blog hop. Thank you, thank you, thank you! Amazing cards! And thank you for the video showing how you did it! Your grid of tiny hearts and the rainbow colours was totally worth your effort. I can't imagine having the patience to use one die repeatedly. However, if the results are this spectacular, I might try. Beautiful cards. I love the card with the heart cut outs! No anything I would have ever thought of. So cute! The Tiara and Party Dress color combination on the Many Thanks card is yummy!! Love it. I also really love that large scallop die--such a pretty edge. Great cards! So excited about this collection. Love the way you used the heart die. Great cards! I love seeing so many different uses for the stamps in the collection! Thank you for sharing your cards with us, and for the ghosting technique tutorial. Fall is my favorite!! I absolutely love these cards. So many options. Thanks for your ideas! Your cards are the Bomb!! Thanks so much for all the inspiration for this release! love, love, love these cards. So creative. Gosh, I love how you cut out the hearts. I've never thought to do that. NICE JOB.